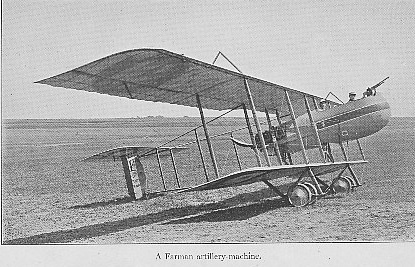 A Farman artillery plane, a two-seater pusher with a machine gun mounted on the nose, the gunner sitting in front of the pilot. Rather than joining his fellow Americans in the Lafayette Escadrille, the author enlists with the French Air Corps, and published this memoir of his flight training and service with the French Air Corps months before America entered the war. Training can be deadly. On his first solo flight, a fellow trainee comes down too hard, and dies. In his final test, another trainee climbs too steeply, goes into a spiral, and forgets his training to turn off his engine. The plane breaks apart, and 'my friend and the motor dropped like stones.' A new pilot takes up a Morane Parasol, and cuts his engine to land, 'not realizing that monoplanes do not volplane well.' He loses, speed, does not dive to recover it, goes into a spin, and crashes. Pilots are trained to volplane, to cut the engine and glide to earth on landing, on going into a spin, on loosing control. One trainee passes out, and his plane safely gets him to earth, controls untouched. At 6,000 feet the air is very cold. The noise is deafening, and it takes time to recover one's hearing after landing. It is hard to gauge whether one is 50 feet above the ground, or 25, so landings can be rough and can be fatal.